Additional Info: Electric fire in living room. We operate a Friday to Friday change over. Weekend and midweek breaks are available on request. When booking more than 6 weeks in advance, a non-refundable deposit of 25% is required. 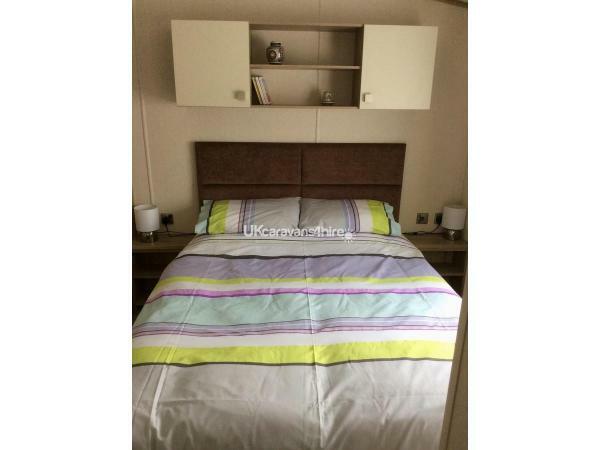 Full payment is then due no later than 6 weeks prior to your stay. 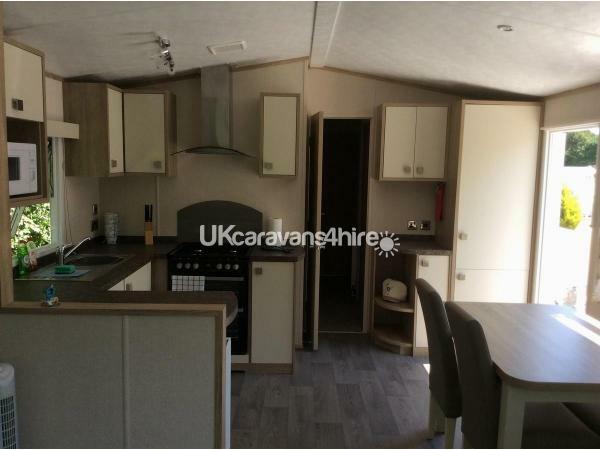 Welcome to our one year old Carnaby Oakdale, fully double glazed and centrally heated caravan in the Sea Breeze area of the 5* Shorefield Country Park, which is just a 5 minute walk from the centre with all its amenities. 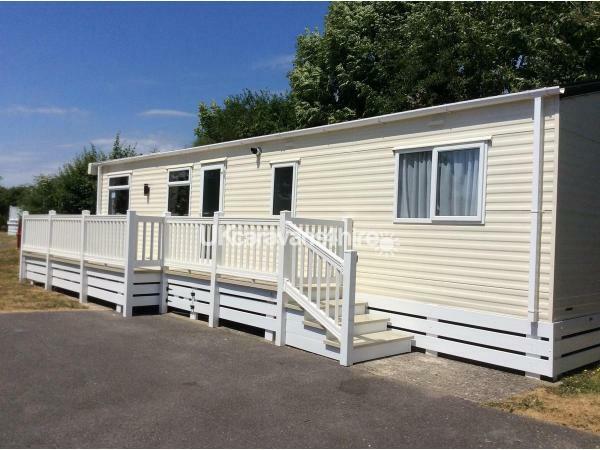 It has parking for 2 cars and secure outside decking complete with table and chairs and parasol provided for your enjoyment. 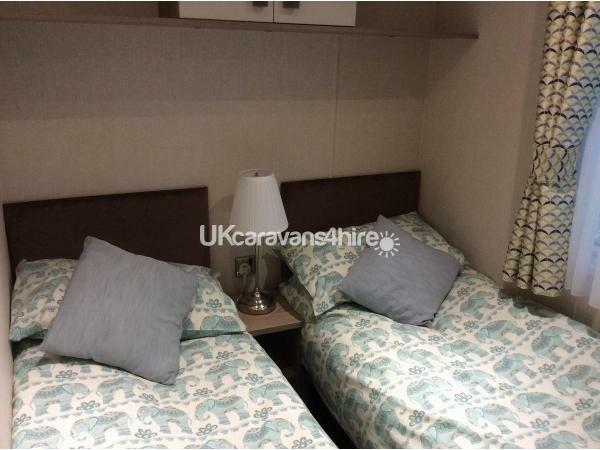 The caravan has two bedrooms (the main bedroom with a 5' king size bed and one twin) plus a sofa bed in the living area. 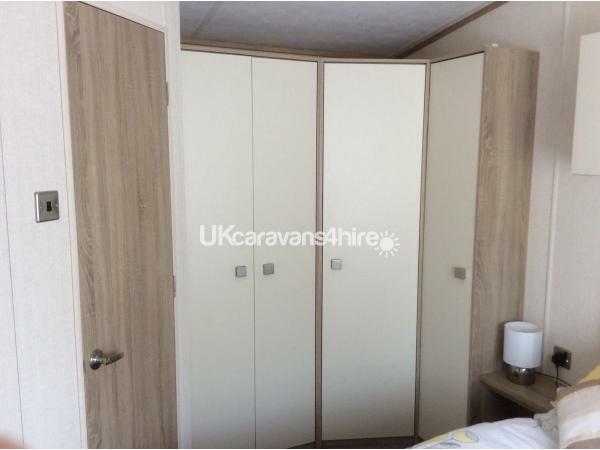 The main bedroom has ample storage with several wardrobes and drawer units. 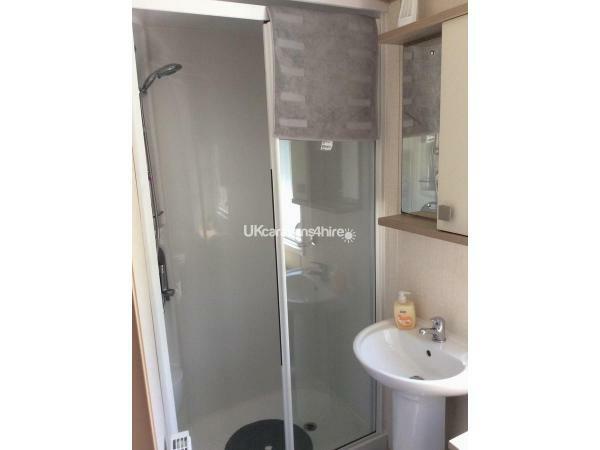 The main bedroom has an en suite toilet with hand basin. 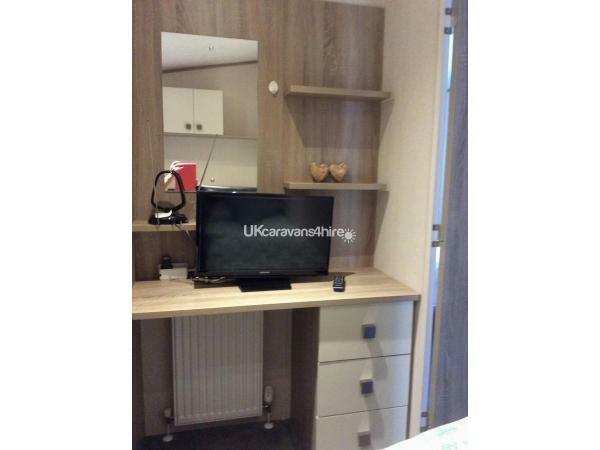 The twin bedroom also has a wardrobe, dressing table and 24" colour tv. In the bathroom you will find a large, walk-in power shower, hand basin and toilet. 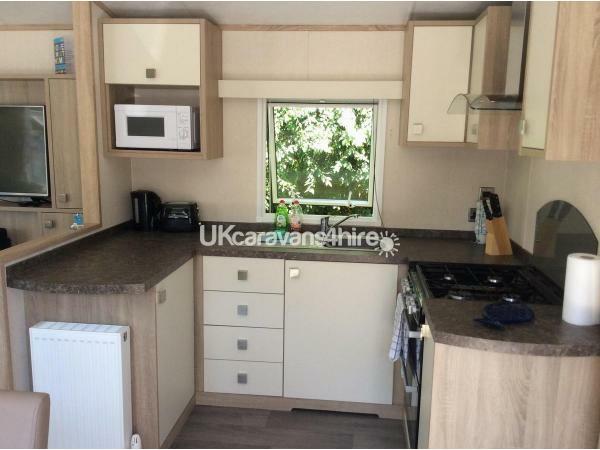 The kitchen is fully equipped for your stay and includes a full size gas cooker and hob, microwave and a 60/40 size fridge freezer. There is a dining table with four chairs to the side of the kitchen area, which leads into the living area. 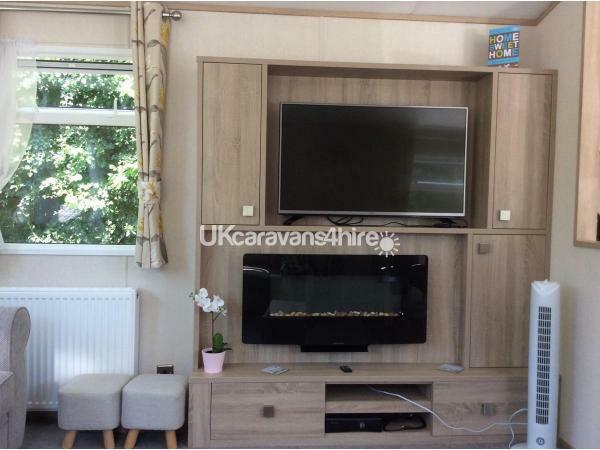 Here you will find wrap around seating which will easily accommodate 6 people, an electric fire, coffee table, storage space etc., along with a 43"
All of the rooms are centrally heated via radiators, with individual valves for setting the temperature in each room. Linen is provided for the bedrooms, but not for the sofa bed. However, this can be arranged for a small extra charge. Gas and electric are included in the hire charge. Wi-Fi is available on site. 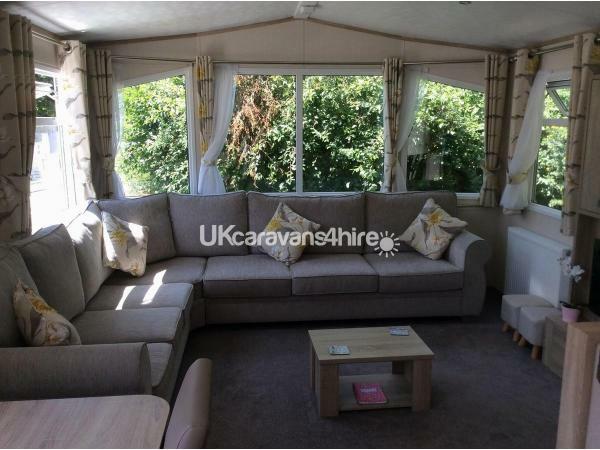 Shorefield Country Park is ideally suited to families or couples on their own. This 5* rated park provides a children's club, children's entertainment and live entertainment for adults. There are bars and restaurants on site, also offering a take away service. The heated outdoor pool provides a smaller pool for babies and toddlers, and there is a small kiosk supplying ice creams, hot and cold beverages etc. so you don't have far to go. The heated indoor pool also has a smaller baby/toddler pool, a steam room, sauna, spa and jacuzzi. Passes for the pool areas are available from reception for a reasonable extra charge. Other facilities on site include: a fully equipped gym and spa treatment facilities; tennis courts; playground; amusements; snooker and pool; mini golf; a small, well-stocked fishing lake in the grounds, for which you will require a rod licence; a well-stocked supermarket, with larger supermarkets locally. If this is still not enough, never fear, the site is only a couple of miles from the heart of the New Forest National Park and the pretty New Forest villages of Lymington and Brockenhurst. Poole and Christchurch harbours are not far away and you can also take the ferry to Swanage for a fun day out. Or take the bigger ferry and try the Isle of Wight out. There are horse riding stables, golf courses, cycling routes, nature trails and fishing all available in the local vicinity. 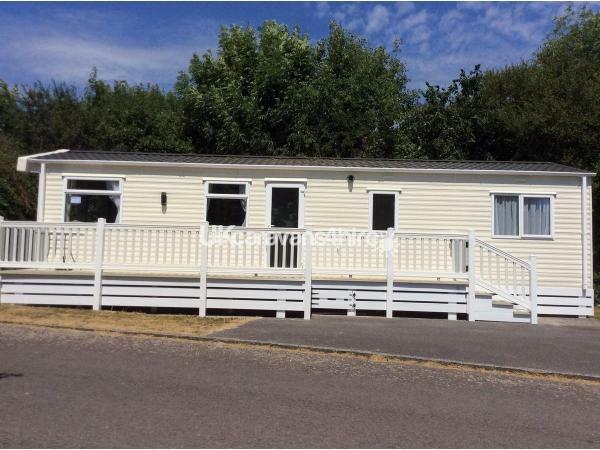 Access to Milford on Sea beach is available from the park, or it is just a short drive away, along with many other local beaches, is the famous sandy Bournemouth beach with its pier and attractions. Other places worth a vising for a good day out in the area include: Beaulieu Motor Museum and Beaulieu Abbey; Bucklers Hard; Paultons Park; Peppa Pig World; Hurst Castle and Marwell Zoo. When you have finally worn yourselves out, stop, relax and have a drink or a meal in any of the lovely pubs and restaurants in the area.